The UCI has changed rule 1.3.024 to allow on-board bike cameras and telemetry boxes to be considered part of the bike. This implies that the camera and mounting bracket can now be added to lightweight bike to achieve the 6.8kg minimum weight. 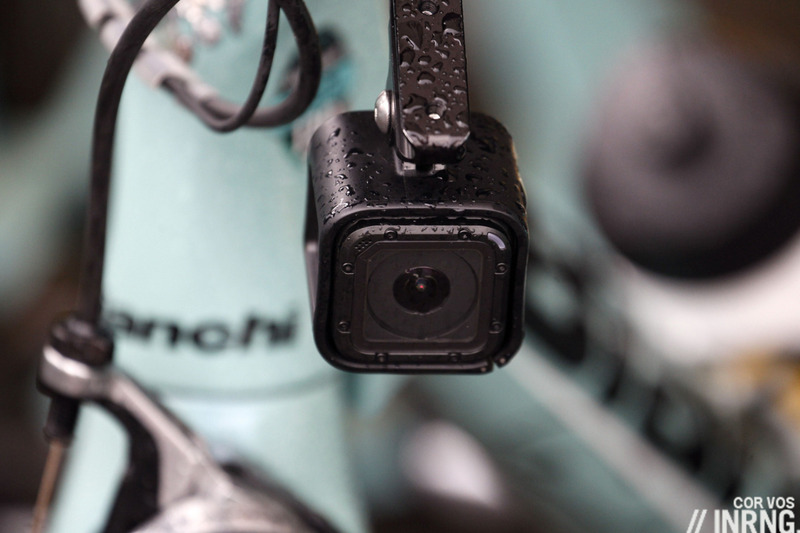 It’s conditional on it being “non-removable” meaning the camera has to fixed to the bike much in the same way the stem or a bottle cage is. Crucially it means there’s no weight penalty for a rider tasked with a camera for the day, if a team has a light bike that needed to have weights added to make the 6.8kg minimum weight now the camera or telemetry box can be bolted on to help achieve this. There’s still going to a small aero penalty. How long until wind-tunnel tested aero cameras? The weight penalty matters for the mountainous Tour de Suisse. Here we’ll see live data transmission and apparently there will be an app out too so you can have your TV with Swiss scenery and your phone downloading data. It’s a technical achievement but not a first, the broadcast of live power data goes back as far as the 1980s. Surely the big test isn’t beaming the stats but their use and interpretation? Most of the TV audience aren’t cyclists, let alone use heart rate or power data. It means only a subset of the audience knows what’s what with the wattages. So it’ll be interesting to see how the data are communicated and the education work involved. This feels like jumping on a bandwagon once it’s arrived. Readers may be delighted to have an event free from politicians but it speaks to the race’s stance as an institution and a popular fixture. Hopefully the 100th edition next year attracts more. Is there a bigger sponsor of cycling than Škoda? The “Škoda Tour of Luxembourg” is on this week and the VW group’s brand supply vehicles and sponsorship for range of races from the Tour de France down across Europe. Fitting as the Czech manufacturer began as a bicycle maker. They’re one of those sponsors who back the sport but won’t touch a team, they pulled out plans to back the Swiss Pro Conti Team Roth over the winter. When people think “who is the most powerful person in cycling” surely the Škoda marketing manager has to be near the top of the list for the money they drop on the sport. It also shows the audience demographic for cycling in continental Europe, vs Lexus cars at the Tour of California or Maserati in the UK, a topic covered before in A Tale of Two Cars. 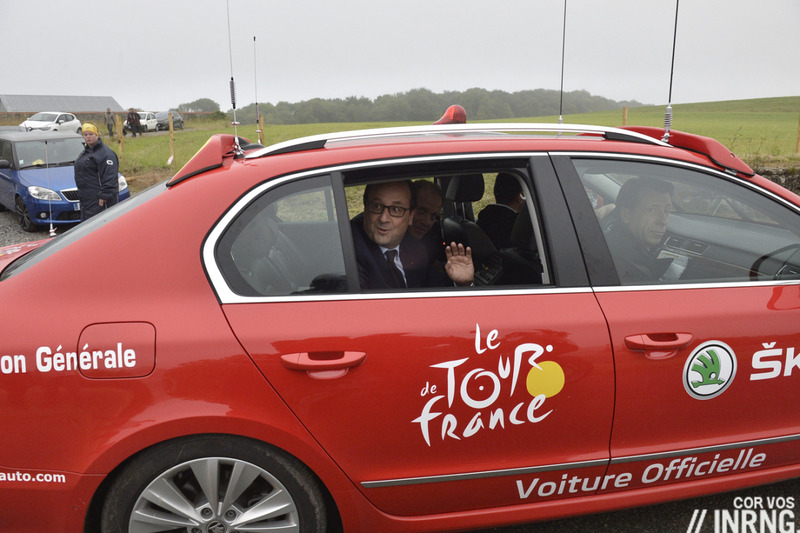 Talking of cars and politics, readers have asked if it’ll be ok to visit the Tour de France given news of fuel shortages and transport strikes. The images of strikes and fuel shortages are dramatic but, like the floods currently afflicting France, local. Just this morning an air transport strike has been called off. The stoppages are part of a ritual negotiation process and like the floods it should all be gone by July. If not, bring your bike. Who knows if Giro race director Mauro Vegni wants more politicians? One thing he does want is more riders finishing rather than pulling out saying they’ve got to prep for the Tour de France. In an interview with La Gazzetta Dello Sport he said he could never have dreamed of such a finish of the race with the Italian national champion winning and the suspense of the final weekend. Asked if he had any negatives it was the exodus of riders from the Giro to prepare for the Tour de France and he’s written to UCI President Brian Cookson asking for something to be done. But what can be done? Already there’s a rule (2.6.026) that says if you quit a stage race you cannot normally resume racing again until that stage race is over but Vegni seems to want more. This is difficult and could encourage a sprinter or his team to pull out citing, say, a vague “knee injury” or “fatigue” rather than being straight with people. Finally Ben Pitman won the Art of The Jersey Book giveaway competition. Only the book can’t be given away until the winner gets in touch, send in an email. – if the race is halfway up a mountain and a GC guy attacks and a smaller group forms, who is left in that group. We often have to squint from helicopter shots to make out who’s who or wait for the motorbikes to catch up (not always possible). Often minutes pass before we realise someone has been dropped. If Horse Racing and F1 can do it (albeit on a circuit) surely cycling can too? I really enjoyed this year’s Giro but some of the racing information on TV still has a lot of room for improvement. …but it’s been caught in the dispute between ASO and the Velon teams. ASO wants all teams to deploy it, the teams want to be paid for it and we’ve seen a stand-off. Hopefully this is resolved for everyone’s sake because as you say it’s vital for knowing what is happening; the same for identifying who is in the lead group of the Poggio etc, it’d be of real use. Rider identification would be great for those days where the riders are wearing rain capes and even the most seasoned commentator has issues identifying who’s who. But I am guessing that there is the potential for telemetry to asssist in situations where (e.g.) a rider gets a lift from a team car. Nibali got caught last year in the Vuelta because the camera’s picked him but I am guessing that flags could be set which alert that a rider was travelling at a speed which were unlikely at that time. May also straighten out what Démare speeds was up the Cipressa rather than there only being an overall time for his ascent. One really simple thing… Rider names on their jerseys. Not high tech, but would really help. It is not easy to recognise a rider in glasses & helmet. I find the (tiny) flags & names on the sleeves of Team Sky jerseys really useful. Is there a reason why all riders don’t have their names down their sides? Totally agree that this would massively help. In terms of there being a reason why not all teams do it, it might be because if a space on a jersey is highly visible then the team will seek to plaster a sponsor on it. A quick look suggests that this is the case with the sides of the jerseys with those teams I checked out using it. I agree, but portemat has a valid point. When Sky first started the names were more prominent down both side panels of the jersey, but now that spot is taken by one of the sponsors, and the sleeve names are nowhere near as prominent. Now, what if the UCI, or the World Tour, mandated and standardised it, like in football (and how about across the back of the shorts too – we get that view more often than not) ? While on that subject, how about “squad numbers” for each team, and get rid of the rather low-tech pin-on numbers which are different for every race ? Sorry, it was One Man Grupetto’s point about the visibilty = desireablity for sponsor ! Given at every race riders pin two white number rectangles over the pockets of their jersey (so no team sponsor names there) and each rider has personally tailored riding kit, I don’t see a lot of reason why those areas couldn’t have squad numbers sublimated on them. Surely it’d be easier to pick a rider from a number (that could be their squad no. for the season) than trying to read a name on a jersey from a helicopter shot. It baffles me that with all the efforts to make everything ‘aero’ and skin tight no-one seems to think twice about pinned-on papery numbers!?! And don’t get me started about Daniel Oss’s hair out the back of his ‘aero’ road helmet whilst he struggled in almost every breakaway of the Giro, could he have stayed away if he had a buzz cut? Agree. I remember my first time watched le Tour, 2012. I couldn’t know what was exactly going on, just beautiful sceneries, let alone the rider’s name. It would be really nice if i can recognise the domestique who’s pulling from start till 3km to go, the guys in the breakway, the lead-out man, etc. It seems to be the case, from the readers on this site at least, that Velon gets the rough end of the stick more often than not. But I am with Velon on this one, I think; how can ASO do a deal with HiKob to use the devices / technology but not pass some of the money on to the teams? That seems to be a very unreasonable stance on ASO’s part..? From memory it’s not ASO. Instead France Télévisions did as they’re broadcasting it but can’t find the press release now to confirm it. ASO should request they get updated to integrate the normal timing transponder, then supply them rather than two separate devices. Don’t have your transponder/transmitter attached when you turn up to sign on? Go away and attach it before coming back. I’m thinking the next big thing for the rider would be a handlebar display showing the relative location of their competitors, realtime. Has social media implications outside as well, so a double selling point? Will be interesting to see how the negotiations between ASO and the teams over this data stick play out. It seems unlikely, but hopefully this will be the catalyst for the riders to get compensation and revenue sharing. The revenue sharing fight, as a topic, is, I think, a little silly. What revenue? A percentage of the gate? Even if there was a gate, how many spectators are there? If you start divvying up the broadcasting proceeds, when will the broadcasters just stop bothering? Same with event organizers. It’s awesome, but it’s cycling. What percentage of people that any of you know follow the sport. Pretty small. Note teams already get money from races already. Team Sky get 12% of their budget from these fees (see http://inrng.com/2015/07/team-sky-budget-finances/), presumably others with smaller sponsorship income get an even greater share of their budgets from the races. Personally i quite like the uncertainty of who has attacked and from which team, the scenario that XYZ has jumped and gone 15secs clear on the top of the Poggio adds to the atmosphere when moments later it’s revealed it’s Bakelandts and he is going for it! They had a handful of points other than those which Tsatevich earned them, so they weren’t in the running to split the prize for the overall winner at the end anyway. HAHA… seriously, Katusha should have received a bonus for what they did. Voluntarily made the race harder for themselves in the spirit of punishing a rule breaker. I guess that concerning the beetroot you can also eat appelstroop, or apple butter in English, as the apples are often supplemented with beetroot juice (I think inrng had a whole series on cycling food a few years back). Much better taste as well compared to all the rocket that you have to munch away. INRNG, you do have the most wonderful cycling blog. Yet even beautiful diamonds can have slight flaws which pique the attention of their admirers. You have a thing for the phrase “yet alone”. Yet the phrase “yet alone” is not a thing. “Let alone” is the mot juste; just the thing for making an already polished diamond even finer. Ah ha- Awesome to win the book! Missed checking the page for the last few days, ironically cycling up the Kwaremont/Paterberg and perusing lots of jersey. I’ll be right in touch! “Where are the politicians?” is an interesting angle on the Giro’s standing in its homeland, which has me asking if the veiwing figures were up this year? One would hope that with a thrilling finale and a native winner cycling in Itay would have been to the fore last weekend (and no Italian team in the Champions League final to draw attention away Nibali’s feat). Italian people loves cycling, but Italy doesn’t. At all. To answer your question, the viewing figures were apparently very good in Italy, although RAI decided to give way less publicity to them than in previous years. The top stages went again well over the 3M mark on both Saturdays, while we were often over 2M during the week (on both the last Fridays, for example). If you sum up RAI and Italian Eurosport, the 20th stage gathered nearly 4M viewers (just in Italy). All in all, it was probably very similar to 2013, or just shy – and that was the best edition in recent years. *Calcio* is on different level, the Champions League final averaged some 8M viewers. It was an excepcional result and there’s an obvious advantage in being a prime time, main channel show when compared to afternoon, on a secundary channel, still there’s a huge difference. What do I mean when I say that Italy doesn’t love cycling as much as Italians do? Well, that most institutions, organisations and companies struggle to understand cycling’s potential and outright importance. The football match to which they dedicated most space, besides having very little importance, gathered 5M viewers in PRIME TIME on the MAIN CHANNEL. We can absolutely say that the 4M people watching the Giro on Rai 3 or on specialised channels on Saturday afternoon represent a greater “mass of real interest” than the 5M supposedly watching that match (most Rai 1 spectators don’t even really watch TV, it’s just the channel that’s always on). Despite of that, RCS, the Giro organisers (!!! ), considered that it was opportune to give more space to the football match, on the front of their most read newspaper edition, than to Nibali’s victory – which had become a fact on the same exact day. (However, what’s impressive about cycling is that the Giro can average 2M along three full weeks, working days included. Two wholly different products, when compared to football. Many football matches struggle to get to the 500K mark, if big teams aren’t featured). In Spain the results were fine, but not as good as last year, quite obviously. The best stages reached 1M viewers (summing up the national sport channel and the Basque channel), the *good* ones were between 700 and 800 K. I don’t have an average, yet, but I think it’s about 500K. It must be taken into account that Teledeporte, the specialised sport channel, produces way worse audience figures than when cycling (same race) is broadcast on a generalist public channel. A broad set of data from the past consistently shows a loss of about – 50% in terms of total audience when the race is on Teledeporte. RTVE’s managers, however, probably think that they prefer to raise a lot Teledeporte’s normal figures than having on the main channels a show, the Giro in this case, whose audience can be obtained, on those same channels, with other products. They took very diverse decisions during last years about the Vuelta and the Tour (the Giro has been on TV only for a couple of years), that is, they switched a lot of different options (everything on a generalist channel, half and half, only the top stages etc. ), I guess they were making experiments to understand what worked best for them, even if having the race on Teledeporte only hinders cycling’s potential audience. Watching RAI here in Italy, I was wondering if they were TRYING to get rid of viewers? The morning show guy, Valerio Something-or-other was a dud as was Marzio Bruseghin. Stefano Garzelli adds little to the Processo while Piergiorgio Severini is like someone’s worthless brother. Andrea DeLuca’s not a whole lot better. Gianfranco Benincasa was decent enough, but Alessandro Fabretti seems to have been promoted right up to the point he’s incompetent as the director of the whole thing? I thought Auro Bulbarelli did a much better job. Finally, they say the director in the truck is the same as always, but for some reason they gave us way-too-many shots of the kooks on the road in various costumes trying to get their mugs on TV + cut to commercials right in the middle of the action. In the past I’d give RAI a B grade or maybe B+, but this year it’s a C or C – at best. They need to do better – Il Giro deserves it. I can’t believe that the director is the same as always, either. Whether there’s been some technological change which creates troubles for him, or he’s just “signing” someone else’s job, I just can’t understand what’s up. They really stepped up quality-wise in 2005-2006, but we’ve been having several steps back during the last three or four years. A money thing? (public TV…? Cuts, cuts, cuts!). What’s incredible is that the Giro is doing great audience-wise, 2013 and 2016 were especially good, but since 2004 on we’ve been having a majority of very fine years (only 2008 and 2012 were a little below the standard)! It’s nearly like as if they were afraid to make it a hugely popular sport again. Gabriele – if they keep this up they might have me wishing for Italia 1 to take over again? I think Francesco Pancani and Silvio Martinello do a great job though I’d rather have Auro Bulbarelli and Davide Cassani if it were possible…and then there’s Alessandra DiStefano, gawd-love-her. She’s probably now in a post beyond her scope but as a woman working at RAI, perhaps she deserves it? It’s gotta be tough working with what seems like a whole lot of men who are in their positions mostly because they’re men, rather than how competent they are. We’ve seen her yelling into someone’s ear when the shots shown on TV are the wrong ones to go with what she’s trying to do along with muttering to who-knows-who when things are (so often) screwed up during the Processo, etc. The Processo seemed dull this year – I understand why they might not want to bring on a bunch of old-timers who argue but the racers are too tired to spend the time blabbing away up there…so too often the chairs were empty – not even Beppe Conti sitting in one. Few DS’ even showed up – odd that nobody wants to get on TV and promote their team and/or sponsors – perhaps it’s because so few are ITALIAN these days? Giro 2016 – a great race, but the TV coverage was less than stellar overall. That answered my question in spades, gabriele – the Gazzetta’s front page was very instructive. Thank you for digging. …And thank you for the link Inrng. It’s great to read a critique of another nation’s televised race coverage (and I also discovered Sonny Colbrelli has pneumonia and that the Tour of Ukraine is going less than swimmingly). Bill, if you read Italian, I absolutely suggest you to follow the Cicloweb website. A handful of guys producing more or less for free – apparently, they barely manage to pay the hosting and web-engineering costs – the best cycling-related content available in Italian language on the internet. Imagine that they were the first ones (in the whole world, in this case! ), years ago, to create and publish online a database “PCS style”. That’s gone lost, with many other features, because the lack of funding is presently sinking them, which would be simply tragic. Since when I moved away from Italy, they’re among my primary sources for national cycling. They’ve also got a great attention towards juvenile cycling, women cycling, track, CX. And a complex, mature and well-pondered stance about doping. Pure passion. They used to have a fine forum, too, but in the last few years I’ve been renouncing to read it since it has been nearly totally spoiled by a bunch of trolls (I never wrote there, to make things clear, I had been just lurking, because you need to register, in order to write, and that’s something I tend to avoid – and I never wrote for the website, this is no ad… I’m even writing for a different webpage 😛 ). I understand why the Giro feels like it looks bad for sprinters to leave early so they can be prepared for other races (e.g. Le Tour). The last week to 10 days of this Giro was all pain and little to gain for sprinters. If you want them to stay, then either provide a more balanced race towards the ends with more opportunities for sprinters or offer a huge financial award for winning the red jersey. Maybe the UCI could offer a greater points reward for winning the points jerseys in grand tours (I don’t know if there are UCI points for this now) but they cannot punish people for deciding it’s not in the interest of the team of racer to finish. Personally, I didn’t mind the sprinters leaving and attention going towards a GC mountain battle. A GC focus the last week or so is completely what I want as a fan. Agreed with your last sentence. I see the supposed “image” problem, but, come on, it’s always happened (and it’s happened to the Tour, too!). The Giro wouldn’t have gained anything in *technical* terms by, say, Kittel trying to stay until the end (he probably wouldn’t have made it anyway). Greipel could have won something more, ok. Maybe. But, sincerely, I wasn’t that depressed by the big names’ absence in TWO (2) out of seven total sprints. The sprint stages are sort of a rest day during the last weeks, they’re meant to help recovering, to foster aggressive racing as we saw on the last Tuesday, knowing that then you can have an easy day, or simply to celebrate, as it is in the last stage. I see that as sort of a false problem. Let’s design a good course for a good race, and let the sprinter decide as they please. As it’s always been. Nobody noticed they weren’t there once the race was really on in its second half, whereas it was great to have them in when the GC race was just warming up. Brings back the issue of the value/reason for the points jersey. Nizzolo won the jersey, but I doubt anyone would consider him the best sprinter who started the race (Kittel, Greipel). It’s obviously a great achievement, but I couldn’t really tell you how he’d done it, despite reading all INRNG’s posts and listening to all The Cycling Podcasts (I have a job and family, that’s about all I have time for!). I don’t blame Greipel for dropping out, but it shows how little he values the Giro points jersey compared to TDF wins (I’d be interested to know how he compares the green jersey to stage wins). I guess the TDF is a bit different because a win on the Champs is almost the World Championship for sprinters so there is extra incentive to get over the mountains. “I’d be interested to know how he compares the green jersey to stage wins”. I can tell you: he *totally* prefers stage wins. It’s easy to see: from a certain point of the race, if you’re really interested in the green jersey (and this was especially true with the previous system), you’ve got to limit your stage winning options, for example marking the rivals or, what’s even more evident, spending the team’s energies – and yours – to collect intermediate sprints (prevent breaks, contest another sprint or two besides the final one for every stage or so), which holds you back from going for the stage victory. The guy would be absolutely able to mark rivals through tough stages, or even to gain points on them, à la Hushovd (ever seen Greipel’s hard man gregario showings in the Classics? )… but he simply prefers the stage wins. He’s got this impressive stat, like he always won at least one TdF stage each year since 2011, but in the same period you can clearly see him let the green jersey competition go in some editions (in 2011 he was even behind Evans, in 2014 behind Nibali! Before noting that those guys won the respective races, remember that mountain stages or ITTs matter way less for the green jersey: Greipel was also beat by the likes of Coquard, Rojas, Renshaw… come on, he was *not at all* going for it), whereas in others he’s up there in the classification as a consequence of winning several stages, but in the last week he always seems relatively more concentrated on winning stages than on scoring points to contest the jersey (compare him with, again, the behaviour of Hushovd, or Petacchi, et al.). Cavendish, OTOH, although he wasn’t *extremely* suited to this specific classification (besides being a great sprinter, which is a very good starting point! ), always showed a strong interest in the green jersey, something I always appreciated in him. That streak puts him ahead of the likes of Cav, Cipollini, and Moser, and equal with Sean Kelly. Only Merckx, Coppi, Hinault and Gaul have longer winning streaks and a stage win in the TdF would put Greipel equal with Charly Gaul. Merckx (of course) has the record with stage wins in 14 successive GTs. I really can’t blame him for going home and having some rest. I can’t catch the “disrespect” thing. It depends a lot on the rider involved. I understand why Vegni is disappointed and it is perfectly understandable that someone with future goals would ride the Giro for training and leave early to rest. If the Tour were the first GT, it would happen to them. Entering a race to train for a future race is pretty common place. Vegni shouldn’t take it personally; the Giro has been a great race lately and he’s doing a very good job except the handling of the Stage 16 in 2014. And that wasn’t really his fault, just his problem. It’s not precisely like they come to train (that was, say, Ullrich), but you’re right: they’ve got other goals ahead in the season, hence when they’ve grabbed more or less enough, or when the cost and risk of any marginal victory is too high, they go away and think about something else. This year it wasn’t a problem, IMHO, not for the race: for Vegni’s pride? Perhaps. They should have built a better narrative, that’s all. That obviously doesn’t happen in the Tour, not to those who consider it the most important race. Any marginal chance to win is worth every effort. It wasn’t always like that for Italian sprinters back in the days or, dunno, for Heras or Simoni and many others who, for different reasons, didn’t see the Tour as the biggest thing of the year (for them and their team). PS I wouldn’t be too surprised if Olympic contenders left TdF early this year (and those won’t be sprinters). There’s only about 2 weeks between them and lots of travel/time difference between the two events. It might even happen with Cavendish. He has previous form for doing that in an Olympic year. Put yourself in the shoes of a sprinter in the mold of Kittel: imagine, 20 years after your pro career ends, you’re at a party and someone asks you what it was like to sprint for victory on the Champs Elysees, or what it was like to ride into Milan/Turin/wherever at the end of the Giro. “Well, to tell you the truth, I rarely made it past stage 10, and never past stage 13…” Is that a response you’d give with pride? And yes, I do understand the practicalities of why they stop when they do. Which makes Greipel’s win on the Champs last year all the more impressive in my book – it was a victory earned, among other things, over ten days or so of sticking it out through otherwise-useless mountain stages. Winning a 3rd TdF would put him equal 5th with Lemond, Thys and Bobet in the all-time standings, with only Merckx, Hinault, Anquetil and Indurain ahead. I can see the attraction, even compared with another GT. There’s certainly a lot more specialism now – Wiggins was the first TdF winner to ride Roubaix since Lemond, I think – so it does seem unlikely that we’ll see many riders compete across the season any more. Even Valverde has said that he’s unlikely to be a challenger in the cobbled classics if he does ride them, as he thinks he’s too light. I agree that among cycling fans, one of the reasons that those 4 riders are held in such esteem is the range of their victories (though apparently Anquetil was criticised at the time for under-performing in one-day races). But among the wider public I suspect a large number of TdF victories trumps everything. Cipollini did that almost every GT and made sure he got his picture in the paper with him and the girls at the beach. Saeco made money from that publicity. All the same, he brought home – I think – a couple of points jersey from the Giro (and that’s harder to finish than the Tour for a sprinter, even if in Cipollini’s days he himself was taking care of *softening* the stages, threatening or directly punching whoever tried to push hard before the TV helicopter was around). I think he was more loyal to the Giro than the other GTs. I believe that the Tour management may have ended up resentful and spiteful that he left and publicized that he had. I can’t remember. And yes to the rest of his behavior; that was a different era altogether. Regarding our conversation on the same topic above and as others have said, there will be more than a few who leave the Tour early to rest for the Olympics. But they are riding initially to support the team and to train. Race kms are often better than training kms. I think Nibali will be in this group. Totally so. I think (but I could be wrong) that they didn’t invite him when he was dressed in rainbow and still able to win Giro stages, in 2003. Even if Leblanc publicly said that he was because they simply preferred to have more mountain-oriented teams (which Cipollini’s Domina Vacanze clearly wasn’t!). However it was just a short catfight, they were inviting him again the following year, despite an under-par beginning of the 2004 season! Frankly, his career was already over… even if he’s still saying that with some three weeks of training he’d beat the present Italian sprinting field, his Liquigas season spoke by itself, not to speak of the Rock Racing late stint. However, Gingerflash wrote somewhere else on this same blog that Cipollini expressed regret for not finishing the Tour. SKY fight for pink? I’m surprised they send any sort of GC contender after their lack of success at La Corsa Rosa. They seem to have a handle on the TdF “formula” so their best chances remain there. Doesn’t hurt that it’s the biggest thing in cycling when your mission is publicity for your TV offerings. I may dislike them, but I understand their focus. I think it’s a smart move to leave the minimum bike weight at the present level and let the teams use the various telemetry gizmos as ballast. I’ve yet to see anything produced by these gizmos that seems worth the trouble, but I’m trying to be optimistic…and I’m happy to see Velon’s greedy ideas thwarted in any way possible. The Giro’s problem with riders bailing out might be solved if they cut the top-tier down to 12. Too many of the top-tier teams show up to events they have no interest in because they have to. Euskatel at Paris-Roubaix was the most jarring example. A dozen top-tier teams with 6 wild-cards would be much better…and if any of those wild-cards had members who bailed out for flimsy reasons, they could count on not getting an invite back in the future. Overall, I think La Corsa Rosa might be better off ignored by Italian politicians – that Padania thing a few years back should be a perfect example of why the two should not mix. Don’t worry, we’ll still come ride bikes with you. But respectfully let’s be clear, it’s not the USA that’s put a “damper” on European travel. We could argue about who is at fault, but this isn’t a political blog so I’ll leave your claim unanswered. ‘A Tale of Two Cars’ is a fascinating read. What is the demographic of Germany’s cycling fans, are they ‘old’ or ‘new’ world? They’re a country of odd contrasts it seems to me – a nation of discreet wealth and savers and cheap food retailers, yet also with a heritage of producing very high-value products (cars, engineering etc). Some of their involvement in pro cycling mirrors this contrast – Lidl, and Skoda cars (it may be Czech but it’s ostensibly a German product) on the one hand, high-end Bora kitchens on the other. And Skoda were always involved in the manufacture of military and engineering products, I wasn’t aware that they made bicycles? I like my military history, and the Germans acquired, shall we say, Skoda during World War II. – Ecky Thump…. as someone who spent nearly 25 years in Sydney and the moved to the Ruhrgebeit in Germany 3-4 year ago (Bochum to be precise), I can certainly attest to the fact it is a stark contrast to not merely Sydney, but what I expect is the story throughout much of the “New” English speaking cycling community. It reminds of what was broadly described in the Inner Ring article sometime ago about “looking ´Pro`” and how it is largely a construct of English speaking cyclists, particularly urban middle class “new golf” types. Not that I´m knocking this per se, but a few examples; In Sydney a LOT of the really serious guys raced….I think this is partly due to the reason that longer distance stuff is to a certain extent restricted by lack of safe, accessible roads. Here it is quite common amongst some of my friends that they will think nothing of going out and riding 150-200km every weekend, (and quite often a LOT more) but at the same time they aren´t always particularly interested in professional road racing, nor are they bothered about shaved legs and so-on… (the horror!) Its a generalisation but there´s not quite so much emphasis on super expensive kit and “looking the biz” …. I think Rapha is generally fairly rare here for eg, although it and that kind of kit is very slowly catching on. The regular availability of RTF´s and Sportives create a different type of challenge for those not really keen to put the bodies on the line in racing, and its quite easy to ride one of these (which often have course options of say 230km and close to 4000 mtrs or even more) just about ever weekend, and usually NOT with the half an hour coffee break either. NordRhein-Westfalen (the state where I live) has just about the most of these and that´s without driving an between and hour and a half to the Ardennes or 2 and a half to Oudenaarde in Flanders for any of the great events on in Belgium. (I did one called La Chouffe Classic just the other weekend which was 170km and 3000 meters right by the Luxembourg border and it was a great event, much nicer than LBL or Fleche). Having raced a bit in the past and “at a certain age” with a young family I find these events a great alternative. Although NSW was always behind the Vics in organising these type of events (and I know there are more coming all the time) , I personally got very bored riding around an urban jungle and waiting for the once a year trip to something like the 3 Peaks (I did 2 or the first 3 before I left). Certainly the recent successes of German riders has seen a resurgence of the sport here I think (looking forward to the Tours start next year just down the road in Dusseldorf myself! ), but try and find a bike shop with say a early morning ride 3 or 4 times a week and you´d be struggling….I asked when I first arrived here and the shops looked at me like I was some sort of madman! 🙂 …. similarly the type of bike shops are very different….you´d struggle – apart from a few specialist shops – to find a road bike in a shop worth more than say 5000 euros, whereas they seemed to START at that price in Australia and just keep going….here the bike shops are servicing bikes that are very much just part of normal day life, not the preserve of lycra glad sports types. Thanks for the interesting perspective from someone with a completely different background, Lee, onto my country’s cycling “culture”. I hail from the region you’re living in now but have moved to the Black Forest twelve years ago. I’ve never been to Australia but from the videos I often see featuring scenes of the war between Australian motorists and cyclists I can fully understand why you don’t want to go back even though the climate is certainly more cycling-friendly in Sydney. The main reason for the differences you describe between Germany, especially the Ruhrgebiet and Australia is that cycling as a sport has always been a working class sport here. That’s where its roots are and although the white collared part of the society certainly takes over the reign now also in Germany’s cycling society they somewhat and to some extent integrate into the existing cycling infrastructure (clubs, races, RTFs, etc.). If the opportunity arises I suggest you pay Freiburg in Germany’s South-West a visit for some days in either spring, summer or autumn and make sure to bring your bike. If you already like cycling in the “Ruhrgebeat” you’ll most probably fall in love with the cycling there although there are not as many events like RTFs here as where you live now. But the riding is still much better and often the weather is too 🙂 . That’s great information chaps, thank you very much, and a little insight in to cycling over there. I’ve been lucky enough to visit a few times (including Freiburg, stayed on a campsite around one of the See’s and it is indeed a beautiful area) and I’m looking forward to the Tour returning. Also to Larry T – your kitchen sounds wonderful. You’re a very lucky man. What comes out of that kitchen is great – all due to the wife, but the kitchen itself is dreadful. In the USA appliances like stoves, ovens and refrigerators were offered in gawdawful colors back in the 60’s like “avocado” and “harvest gold” (that’s ours) while “all-electric” was pushed by the power utilities. The house we live in has all that…but I’m not dumping any money into remodeling as we hope (especially of Donald Trump gets elected) to get the heck out of the USA sooner, rather than later! Larry, if you do leave the US, will you start writing all your comments in Italian and leave English aside? Ronin – my Italian is pretty bad. My Italian language instructors (gawd bless ’em) call me “molto communicativo” but at the same time I soon get the nickname in the class of “Il Disastro” and used as an example. They tell the other students, who are afraid of getting it wrong so they look at the ceiling as if the proper sentence and grammar were printed up there, “Look, you can’t be as bad as Il Disastro here, but he has no fear of getting it wrong, he’ll keep trying until he gets his idea across – which after all, is THE purpose of language! No surprise Pip leaving BMC. he doesn’t get along with that other rider at BMC who doesn’t win anything either. Hope Pip can be revitalised somewhere else next year. 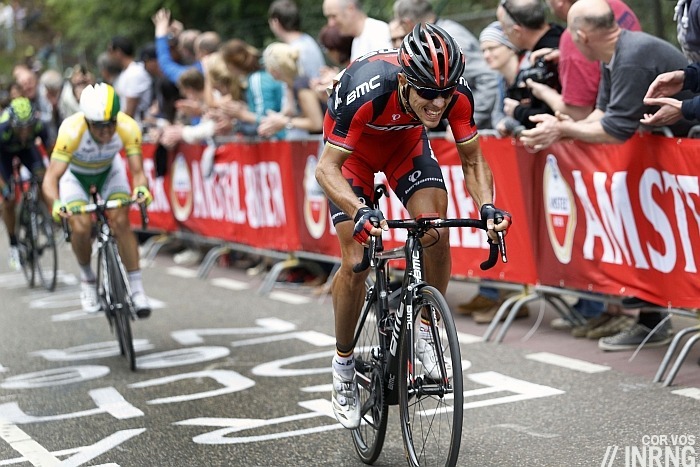 Tejay van Garderen and Gilbert don’t get along?! Gilbert is a crybaby diva. He should retire and go sing pop tunes with his wife. a) Given the high speed of some of the short mountain stages, how many of the sprinters would have failed to make the time cut, even if the bus had got its act together due to the lack of a large decent and/or flat section to pull back time before the final climb? b) Has this year seen a higher than normal number of riders abandoning for vague ‘illnesses’ (as opposed to those retiring due to crash injuries) and how does it compare to those years where the likes of the Zoncalon and other super steep ascents were in the race? If a group of more than a handful comes in outside the time limit, they can stay in the race but will receive a penalty in the points standings equivalent to the points available for winning a sprint stage. I believe this once affected the outcome of the green jersey – and quite rightly so in my opinion. I miss the news that Eddy Merckx is facing corruption charges. He is accused of bribing a Brussels police chief to buy 46 Merckx bikes for the police squad. The maximum sentence is two years in prison. You’re right but I don’t have much more to add other than the news that’s everywhere else, it looks like a police case more than a cycling story. I wonder how long this will take to investigate/prosecute? I record all my races with my own camera, but to be honest, I’d prefer a helicopter view or even conventional footage from a motorbike. On board footage from the pro peloton basically can only be of any interest in a sprint finish or in a dangerous situation, a crash or a just avoided crash. I agree. They are great for short grabs, but only really of use in post-edited highlights packages. The short segments of live onboard during the boring middle part of the flat Giro stage won by Kluge were kind of cool to see, but that novelty will wear off. I’d love to see an onboard view of a descent being raced though – regardless of whether it’s live or shown during a later flat stage.